There were 12 United States congressional districts in New Jersey based on results from the 2010 Census. There were once as many as 15. The fifteenth district was lost after the 1980 Census, the fourteenth district was lost after the 1990 Census, and the thirteenth district was lost after the 2010 Census. In the 114th Congress, Democrats hold six seats and Republicans hold six seats, representing New Jersey in the United States House of Representatives. The 115th Congress saw Democrats holding seven seats and Republicans holding five, with seven-term Republican incumbent Scott Garrett of the 5th District replaced by Democrat Josh Gottheimer. Democrats currently hold eleven seats, and only the 4th District seat is held by a Republican. 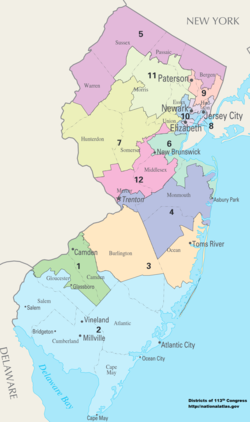 List of members of the New Jersey United States House delegation, their terms, their district boundaries, and the districts' political ratings according to the CPVI. The delegation has a total of 12 members, including 11 Democrats, and 1 Republican. NOTE that the district maps that pop up when hovering over the left column do NOT match the district maps in the right column. One column or the other evidently dates from before the re-districting based on the 2010 census. 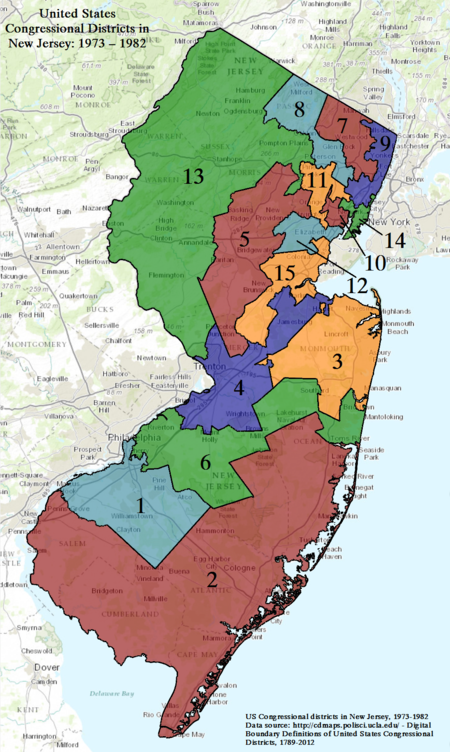 Below is a table of United States congressional district boundary maps for the State of New Jersey, presented chronologically. All redistricting events that took place in New Jersey in the decades between 1973 and 2013 are shown. ^ "The national atlas". nationalatlas.gov. Archived from the original on February 22, 2014. Retrieved February 22, 2014. This page was last edited on 19 February 2019, at 17:55 (UTC).